Microbiological testing is used in a variety of applications by a number of different industries including food and beverage, pharmaceuticals, industrial hygiene, environmental and water. 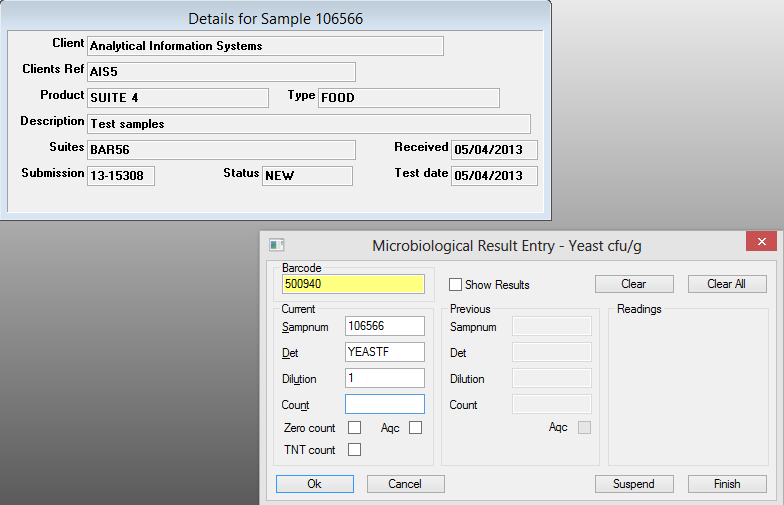 Typically, customers using this form of analysis will use our AIS LIMS microbiological result entry module for which labels are generated with unique barcodes for identification of culture plates. This module automatically accounts for plate dilutions and can work out the weighted average result if multiple plates are counted for the same sample and analysis, thus meeting the ideal plate count criteria. Using barcodes to identify samples is a quick and efficient way of capturing data accurately. Both inexpensive and user-friendly, barcodes are extremely versatile and provide an indispensable tool for tracking a variety of data including the required tests to be performed on the samples, any associated dates and necessary incubation timeframes to name but a few.